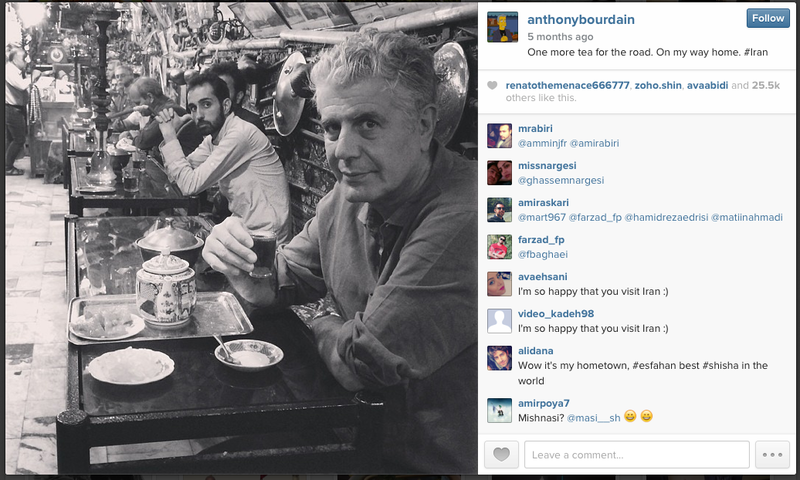 The very first time I saw Anthony Bourdain post a picture of his recent travel to Iran I first looked at the picture in complete disbelief and then I started jumping up and down from absolute happiness. I have been saying this for a long time now that our food is finally getting the recognition that it deserves. I can’t tell you how happy I feel every time I open a food magazine and there is a Persian recipe. But now back to Mr. Bourdain. I marginally knew who Chef Bourdain was before he published his book Kitchen Confidential in 2007. I absolutely LOVED the book and instantly became a fan. I really enjoyed his series “No Reservations” on the Travel Channel. Of course I am also a fan of his current CNN show Parts Unknown. Tonight at 9PM Eastern time the Iran episode of CNN Parts Unknown will air. This is a big deal for us Iranians. Here are some teasers from tonight’s episode. Are you salivating??!! I totally was when I first saw this video! All I can say is thank you, Chef Bourdain! My admiration for you just went up a few notches! I absolutely agree with you. Persian food is one of the best kept secrets when it comes to ethnic foods. I live in Arizona and we have less than three restaurants serving Persian food. To go on record, i absolutely love it. I own a book called ‘Food of Life’, and i love love love it. I have been cooking through it and its one of my fav books ever. It has 100 pages of rice based recipes and i love rice based anything. Thank you so so much for this beautiful blog and all the things you share. – A lurker of your blog who seldom expresses thanks. Ah…I have many wonderful memories of my Tehran neighbors calling me in, saying “come! eat!” and I did! Found your site after watching Bourdain! So excited to try some recipes. Thanks. Thank you for tipping me off to this. I enjoyed it immensely. I have a Persian brother, so to speak. He came over to the US before the revolution. He left a completely different Tehran. However, his misfortune was my fortune. I have been eating and cooking the amazing food of the Persian culture (Note: Persian) and eating in his and his friends’ homes. I would say that with this particular bunch of engineers, the men cook better than their wives, even though most of them are Persian as well. What strikes me most about the culture is the similarity to eastern Europeans when it comes to the joys and duties of being a host. What I like best about the cuisine is that it is the most beautiful, interesting, and healthy on the planet. Thanks for this blog. The various stews, kababs, and rices have been on my little white menu for 35 years. This week, though, ab-goosht. Funny, I was describing it to the family yesterday (I haven’t had it in years) and there it was in Bourdain’s show! Anyhow, keep up the wonderful and beautiful work.